I have this list from a contracter listing what i need to do. 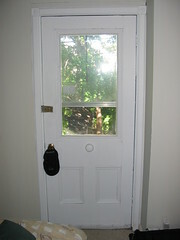 On the second story (my current apartment) in the main bedroom at the back of the house, is a door. This is the only external light source of the room (as there is a window in it). The door leads to a 6x11 rooftop underwhich is the laundry room accessible from both units. Hence, i can hang out out there if i like on the roof. Now, the fire retrofit report i have says i either need to construct a pressure treated deck out there OR, install a casement window. It is not specific about where this casement window need be, only that it need be in the room. Doing a search for casement windows and fire retrofit reveals the need for a second means of egress in the ontario fire code. Do you think, for instance, removing that door and putting a casement window in its place would satisfy the code? Does that make any sense at all? Or installing a casement window on some other wall in the room - how is that going to make egress easier when theres a door right there?? I'm confused and obviously need to read this code very carefully to figure it out. In other news i had a nice induldgent free week to satisfy my cold, but it doesn't seem very satisfied... it feels gnarly in fact. I did induldge in a few drinks last nite, which kinda made it worse, but i blame the contact c.